Pygmy Date Palm (Phoenix roebelinii) - This tropical date palm is usually found in sets of three’s or two’s, and is a very easy to take care of palm tree, requiring small amounts of watering and fertilizer. It has graceful leaves and normally grows to a maximum height of 10 feet tall. 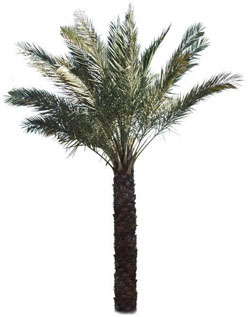 The Pigmy Date Palm has been a favorite for indoor potting for decades as well as a staple for outdoor landscaping. Looks great in doors or out, residential, commercial, office or retail. 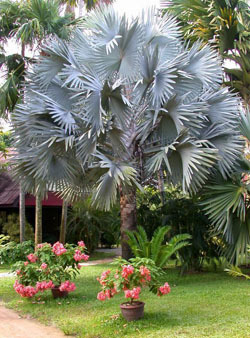 Silver Bismarck Palm (Bismarckia nobilis) - Stunning silver / blue color fan palm fronds that can reach 10' in diameter. This is considered a treasure amongst jungle and tropical enthusiasts. Is very hardy and loves lots of sun. Mature,they provide huge canopies and shade. Regular watering and light fertilizing. Frost Tolerance: 'Silver Select' variety resists down to 26°F (-3°C). Triangle Palm (Dypsis decaryi) - Renowned for its distinctive 3 sides crown and triangle frond pattern. This is a true head turner. 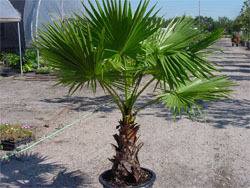 If you are out to impress with your landscape, then the Triangle Palm is a must have. Very hardy and easy to care for. Frost Tolerance: to 28°F (-2°C). Areca Palm (Dypsis lutescens) - Areca palm is a popular tropical plant. It has glossy, graceful, feathery compound leaves that have long, narrow, bright green leaflets along a yellow frond stem. In summer it produces small yellow flowers followed by yellow to purple fruits. This pleasing palm forms multiple trunks and large clumps. 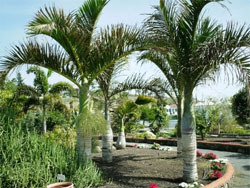 It is used extensively as a landscape palm in frost-free locations and an interior specimen where not hardy. Outside, it prefers full sun to partial shade and very well-drained, fertile but acidic soil. It is drought tolerant, but looks much better with regular watering. Arecas are heavy feeders and show blatant leaf-yellowing in sandy or alkaline soils; use a complete, balanced fertilizer with minor elements regularly according to label instructions as well as using mulch. Prune by removing individual canes at ground level and divided the clumps for propagation and thinning. Australian Fan Palm (Livistona australis) - A tall palm with bold fan-shaped leaves and a straight solitary trunk, this native of coastal eastern Australia is also noteworthy for its cold-hardiness. The large, glossy green, evergreen fronds are divided into up to 70 long, dangling, lance-shaped segments, that radiate like the spokes of an umbrella. Thirty-five to sixty fronds are borne atop the trunk on long ascending, horizontal, or drooping stalks ("petioles"), forming a dense, spherical crown. The petioles are edged with short tooth-like spines. A "skirt" of hanging older leaves sometimes fringes the base of the crown. Plants are initially stemless, developing a trunk after 10 or more years. Trunks of young plants are clothed with shaggy, matted, spiny fibers. Older trunks are smooth and gray and dotted with knobby scars left by fallen leaves. Showy upright inflorescences with numerous drooping tassel-like clusters of small creamy flowers appear among the leaves in spring. Although bearing apparently perfect flowers (with male and female parts), individual plants function as males or females, with only some producing fruit. "Female" plants produce small spherical fruits that ripen maroon or black. Birds and other wildlife eat the fruits. Canary Island Date Palm (Phoenix canariensis) - A large evergreen plant with dark green, arching leaves atop a massive trunk, Canary Island date palm is architecturally stunning. The trunk is decorated with ridges and old frond boots, often making the crownshaft resemble a large pineapple. Its fronds are pinnate (like a feather) and can have a slight blue-green or silvery tinge. Lowest leaflets on the front are stiff, vicious spines. Early summer-occurring flowers are pale yellow and produce semi-dry, yellow-red fruit. It is a native of the Canary Islands off the northwest coast of Africa. 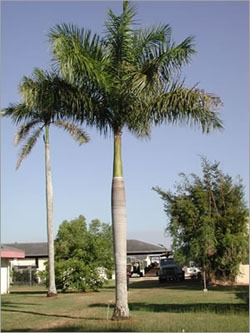 Carpentaria Palm (Carpentaria acuminata) - Similar in appearance to Christmas palm (Veitchia merrillii), Carpentaria Palm has an advantage in its faster growth. 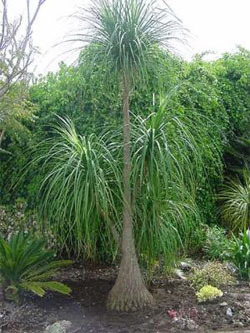 This tall, slender palm grows to 40 ft (12 m) on a single smooth grey trunk. The attractive crown is composed of 10-12 gracefully arching leaves, which are deep green on top and blue-green below. Each leaf has a pinnate or feather shape and is 5-6 ft (1.5-2 m) long with 2 ft (60 cm) long leaflets. Carpentarias have a smooth green crownshaft. Both male and female flowers occur on the same inflorescence and are green to white in color. The fruit is 0.5 in (12 mm) in diameter, red in color, and should be avoided as it is an irritant. Chinese Fan Palm (Livistona chinensis) - The Chinese fan palm is a slow growing, fairly hardy subtropical palm revered for its large fan-shaped fronds with pendent tips. 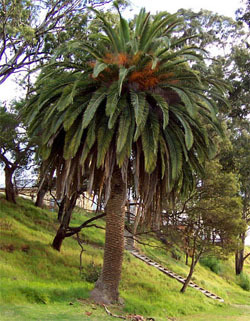 It is an adaptable palm that grows well in arid or seaside locations as well as more amendable ones. Its light grayish green, evergreen fronds are glossy, rounded and large. Each is held on a long petiole armed with large teeth (younger plants have the most teeth). Each fan-shaped leaf has many pointed segments that are fused at the base. The free tips droop downward making them look shaggy and hair-like. During the warm months, a large, branched floral stem appears at the base of the leaves, or the crownshaft. It becomes covered with hundreds of cream colored flowers, which are pollinated by insects. Blue-green or pinkish gray, round fruits develop towards season's end. Christmas Palm (Veitchia merrillii) - The Christmas Palm is a neat little palm that resembles a dwarf version of the royal palm (Roystonea regia) which it matches in beauty if not in size. It has a single slender gray stem that is smooth, sectioned by leaf scar rings and is swollen at the base. A short green crownshaft supports a neatly compact crown of about a dozen, plus or minus a few, pinnate (feather) leaves. These are arched and about 5 ft (1.5 m) long with leaflets that are about 2 ft (0.6 m) long and 2 in (5 cm) wide. 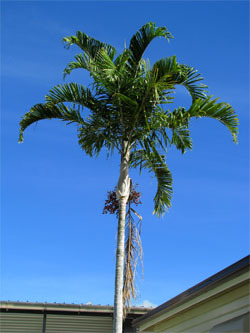 Christmas palm grows to an overall height of about 16 ft (5 m). Cliff Date Palm (Phoenix rupicola) - The cliff date palm, growing to only about 20 ft tall, is smaller than many other common palms. It is a tree with a cleaner appearance as the trunk is clean, not retaining the old leaf bases like other date species. As the leaves die they are shed leaving a smooth trunk ringed with narrow scars at the point of attachment. The leaves of palm it apart from the rest. 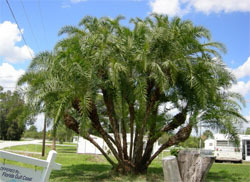 The leaves, which grow to about 10 ft long are bright green color and are arranged in plane on the stem which gives the fronds a flat appearance that combined with their unique, natural curving, arching and twisting form results in a very graceful palm. Flowers are small, creamy yellow, in large clusters, made and female on separate trees. The purplish red fruit is less than 2 cm long and has a thin layer of edible flesh. 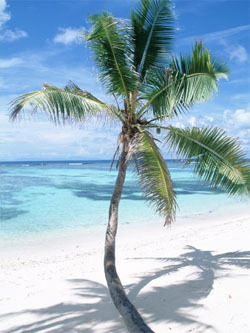 Coconut Palm (Cocos nucifera) - This is perhaps the most visually recognizable, romantic palm in the world. Coconut palm is commonly associated with the beaches of the South Pacific but is found in coastal tropical areas worldwide. 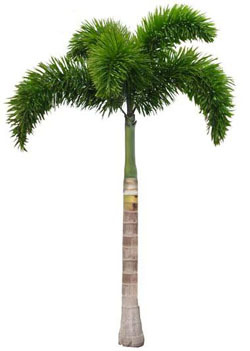 It is a true palm that produces a crown of large, feathery palm leaves at the top of its long, bare trunk. 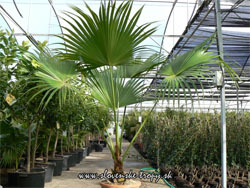 The large, pinnate leaves of coconut palm are deep green, sometimes with yellow petioles. Mature specimens produce branching inflorescences with numerous tassels of yellow male and female flowers. The bulbous female blooms, at the base of the tassels, produce coconuts after pollination by bees. Coconut husks can be green, yellow, orange, or red. The enormous seeds inside are what most typically refer to as coconuts. The woody seeds are filled with flavorful coconut milk and lined with tasty white meat. Dactylifera Date Palm (Phoenix dactylifera) - A tall palm with an upright feather-duster crown of long gray-green fronds, the date palm produces large pendent clusters of the sweet edible dates of renown. Borne in an arching clump at the apex of the trunk, the fronds have many slender leaflets with the lowest ones reduced to large, nasty spines. The canopy of this species is sparser and more upright than that of other date palms. Mature specimens often send up additional trunks from their base. With the heat of late spring, branching stems bearing hundreds of tiny white flowers droop from the leaf crowns. Each tree is dioecious, producing only male or female flowers. Female trees bear oval single-seeded fruits that are golden yellow or reddish brown when ripe. The flesh that surrounds the hard seed is sweet and juicy. Foxtail Palm (Wodyetia bifurcata) - Foxtail palm is a tall, feather-leaf palm. Its unique fronds are divided into mid-green leaflets which radiate in all directions from the leaf stem, giving a fox-tail effect. A mature foxtail palm's crown is broad and gracefully arching feet across and comprises eight to ten fronds. Clustered white flowers develop into brilliant orange-red fruits the size of chicken eggs, which can cause considerable litter when they fall. The trunk is slender and mottled brown and gray with close rings of leaf scars and a slight bulging in the middle. Majesty Palm (Ravenea glavca) - This palm is native to the dry forests and along sandy stream sides and in ravines of the Central Southern Andringitra Mountains; an area of Madagascar that is dry but not arid. The slender trunk is small caliper up to 4 inch diameter, solitary with no crown-shaft. The leaf type is finely pinnate with graceful and durable dark green bi-color leaflets which are silvery underneath from a waxy coating which gives the species its name. There is also no armor on this palm. The crown will have about 14 to 20 slightly arching fronds. Easy maintenance is another attribute that will make this popular in cultivation. Mature plants will also tolerate short periods of regular frost. This variety of Ravenea is becoming very popular, not only because of its small size with a moderately fast growth rate, but especially because it does not have the yellowing problem that plagues its big brother R. rivularis. 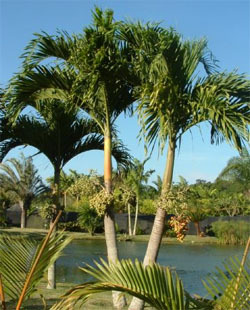 Montgomery Palm (Veitchia montgomeryana) - This tropical palm grows to 35 feet tall and has stiff, feathery-textured fronds. In summer, it bears yellow flowers followed by fruit that ripens to bright red. It tolerates both alkaline soil and coastal conditions well. Provide fertile, moist but well-drained soil in full sun. Indoors, provide a peat and sand-based soil mix in full sun; water and fertilize in spring and summer, sparingly in winter. Paurotis Palm (Acoelorrhaphe wrightii) - The paurotis palm is a terrific multi-trunked, clump-forming palm crowned with large, fan-like fronds. It is native to the western Caribbean Basin, from the Bahamas westward to the Yucatan of Mexico and Costa Rica. Native populations also exist in the southernmost tip of Florida, hence its other common name, Everglades palm. 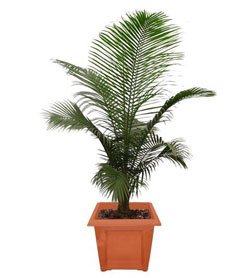 This sun-loving palm can withstand moist soils, some drought and moderate salt spray, so it is also quite resilient. Each rich green frond is like a wide fan comprising many long, sharp-tipped leaflets. The leaves tend to be lighter gray-green on the underside and are held by long leaf stems, or petioles, which are armed with many sharp, hooked teeth. As the leaves die, the petiole bases persist along the lengthening, fiber-coated trunks. During extended periods of rain and warmth, mature specimens will produce small creamy-yellow flowers in long clusters that arch above the leaf crown. The insect-pollinated flowers are followed by small, round fruits that turn from orange to black. Pindo Palm (Butia capitata) - Pindo palm is an evergreen single-trunked palm with blue-green to gray-green fronds that beautifully arch downward. Native to the seasonally wet/dry regions of southeastern Brazil and adjacent Uruguay, it is the most cold-hardy feather-leaf (pinnate) palm. The thin leaflets of each frond are held at an angle, making it have a V-shape in cross-section. The lower part of the frond stem, called a rachis, has small teeth. Summertime flowers are yellow, borne upon short but many-branched stems at the base of fronds, later producing sweetly edible yellow-orange fruits. Adding a tropical feel to many areas in the warm temperate zones around the world, those with more silvery tones in the foliage tend to handle colder winters slightly better than those of solid green to yellow-green fronds. Pony Tail Palm (Beaucarnea recurvata) - Heat and drought are no problem for this tough plant. Ponytail palm is a tall, palm-like plant that is not a true palm but is closely related to agave. It has an upright, fleshy, trunk-like stem that becomes swollen at the base, where is stores water. This is topped with clusters of long, curved, sword-shaped leaves that hang down giving the appearance of a pony’s tail. When mature, it produces panicles of fragrant cream colored flowers that are pollinated by bats. 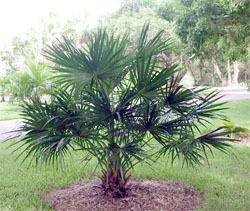 Ponytail palm thrives in hot full sun and requires average to poor soil with good drainage. It makes an excellent houseplant and does well in containers. Where hardy, this plant is well suited to mixed borders and makes a nice specimen plant. Reclinata Palm (Phoenix relinata) - With multiple narrow, arching trunks and lush, gracefully arching green fronds, Senegal date palm is a picturesque garden specimen. It is an evergreen that grows as a thick, impenetrable clump. The fronds can become quite long and gently arching, bearing many glossy, mid- and dark-green leaflets. The lower leaflets are modified into brutally nasty spines, called acanthophylls, which are never forgotten once a hand reaches into the base of the clump. In the warmth of summer, branched clusters of cream colored tiny flowers dangle from the base of the fronds. This species is dioecious (male flowers on some plants, female flowers on others). The fruits on the female palm are oval and brownish red when ripe, dry (no juicy flesh) and edible, but not overly tasty. The seeds drop and quickly germinate nearby, guaranteeing that this species remains known as a clump or thicket-forming palm. Royal Palm (Roystonea) - The royal palm is perhaps the most regal of all palms with its smooth gray trunk reaching skyward. 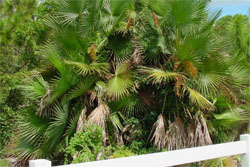 The top of this palm is capped with a lovely crown of large green pinnate (feather) fronds. The trunk has the appearance as if it was cast of concrete. The creamy, cup-shaped flowers with purplish anthers are borne in large clustered panicles and yield purple fruits. 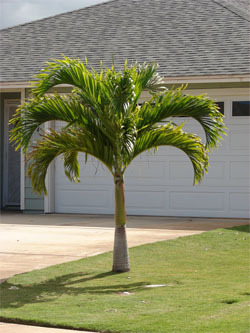 The royal palm should be planted in a well-draining soil that is moist. It is very tolerant of calcareous, alkaline soils and grows better with a top mulch in these conditions. This palm is self-cleaning, meaning it sheds its oldest fronds. 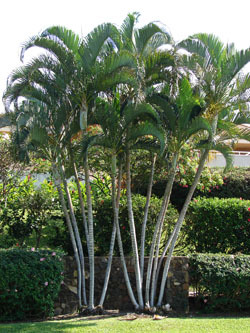 These fronds are sturdy and heavy and can damage property or threaten human safety when falling. As a survival mechanism, fronds are shed in tropical storms to lessen wind stress on both trunk and crownshaft. This palm is used worldwide for magnificent tropical allees, commercial plantings and public parks. Its tall mature size is out of scale for a mere one or two story building. 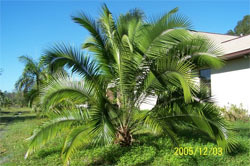 Royal palm bug can negatively affect newly emerging fronds. Spindle Palm (Hyophorbe verschaffeltii) - Spindle palm is a single trunked palm with few, stately, large, feather-shaped fronds. Native to the small Mascarene Islands in the Indian Ocean, its smooth gray trunk is narrow at the base and top with a gentle bulbous swelling in the mid-section. It is nearly extinct in the wild. In summer, fragrant, small ivory to orange flowers are produced from the upper trunk, then followed by orange-red fruits. The leaves, which rarely number more than five or six, are bright green on top and gray underneath. They are arranged at an angle on the stem giving a very full look to the frond. The crownshaft is large and smooth and is tinted light green to pale blue. Spindle palm requires full sun and a well drained soil that receives adequate water in the summertime. It is marginally cold hardy, not pleased with even a hint of frost, and is slightly susceptible to lethal yellowing disease. 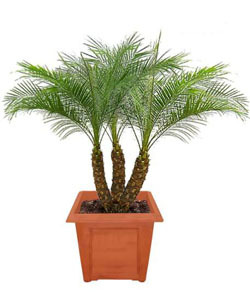 This palm is usable as an exotic houseplant when it is young as long as it receives lots of sunlight. 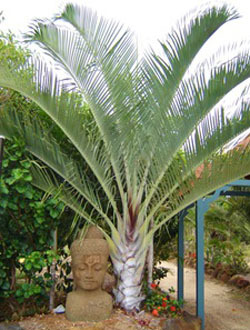 Sylvester Palm (Phoenix slyvestris) - With a fountain-like, silvery crown and slender, medium-tall trunk, resembles a scaled-down Canary Island date palm. Upwards of 100' long, slender, feathery leaves arch from the apex of the solitary trunk, which is ribbed with the diamond-shaped scars of old leaves. Each frond has many narrowly lance-shaped leaflets of gray-green or gray-blue, arranged in several planes. The lowest leaflets are modified into sharp spines. The woody bases of the leaf stems ("petioles") often remain on the trunk, giving it a bristly "pineapple" appearance. In spring, branching stems bearing hundreds of tiny, yellowish white, fragrant flowers appear amid the leaves. Female plants bear oblong, sweet-fleshed fruits with a large central seed (pollen from a male plant is required for fruit production). The fruits ripen yellow-orange in summer. 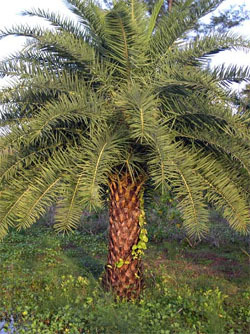 In India the sap of this palm is traditionally used to make sugar and an alcoholic beverage called "toddy". The fruits are good fresh or in preserves. Washingtonia Palm (Washingtonia robusta) - Growing to huge heights, the Washingtonia fan palm is a commonly planted, long tall palm from Mexico. Its trunk is marked with the remains of old leaf bases and has a coarse appearance. Throughout the season it bears broad, showy, fan-shaped leaves of green that emerge from long, sharply toothed petioles. New growth emerges from the terminus of the tree giving plants a feather-duster appearance. In summer it bears clusters of ivory flowers followed by black fruits. 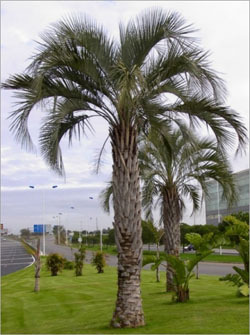 Sun-loving by nature, Washingtonia fan palm is tolerant of poor soils and can withstand mild droughts although it appreciates and responds nicely to moist soils. In warm regions it is most often featured as a street or landscape tree. Old, brown leaves persist on trees creating an unkempt, shaggy thatch over time, so it’s best to remove these regularly if possible.